I was browsing through Ravelry the other day, on one of the forums I follow regularly, and saw the following quote: “This is quite possibly my most impressive knit……Of all the things I’ve made, I think this is one that most looks store-bought.” This was accompanying a project photo of a lovely cardigan knitted by a very accomplished young knitter. She has many dozens of beautiful knitted projects on her project page including lots of perfectly fitted sweaters, made wth great artistry and skill. I have many times been complimented on my knitting by someone saying “It looks just like store-bought!” It is clear this is meant to be high praise; inherent in this statement is the assumption that handknit garments are poor cousins to their manufactured counterparts. A hand knit garment is assumed to be ill-fitting and poorly made, perhaps with wonky stitches and novelty yarn. If you are wearing a handknit sweater, this line of thinking goes, you either can’t afford a proper sweater, or have to appease a knitting relative, probably an elderly, style-challenged granny. I find that the more I think about this statement, the more it bothers me. Let’s start by considering the idea that if it fits properly, it can’t be made by hand. This, besides being untrue, is very obviously counter-intuitive. Clothing manufacturers knit to standard sizes. These standards are set periodically, and change slowly over time as people’s bodies change. However, they are determined based on averaging over large populations of people. When you buy a sweater, it is sized according to the bust measurement; it is somehow assumed that the sleeve length, body length, waist, armhole depth, shoulder width, etc, are predicated upon the bust measurement. A manufactured sweater with a 32″ bust will be built with shorter sleeves than a sweater with a 48″ bust, because the 32″ bust is categorized as size small and the 48″ bust as size large (or extra large). Just look around you to see the fallacy of this. People aren’t built this way. For every person who can buy clothes that fit perfectly right off the rack, there are two who can’t. Emma has a hard time finding sweaters that fit in her shoulders and bust that are long enough in the sleeve. Two women may have identical bust and waist measurements, but one may be high waisted and one low waisted; the same sweater will not fit them both properly. When a sweater is knit by hand, it can be tailored specifically to the person who will wear it. I take measurements constantly when knitting a sweater by hand. First, I take very exact measurements of the person, lots of them. I took a knitting class with Shirley Paden once and she handed out a measurement chart to be filled in when knitting a sweater for someone; it contained 17 separate measurements you needed to properly fit a sweater. (If you are interested, these charts are included in her excellent book, Knitwear Design Workshop: A comprehensive guide to handknits.) Then, I take many measurements of gauge. I measure gauge over all of the different stitches used in the sweater, and I take these pre- and post wet blocking and drying. Finally, I measure constantly while knitting. If the sweater is knit top down and can be tried on, I put it on the body every 2 inches or so, and consider it carefully; does it fit properly? If not, I rip and revise. If it can’t be tried on, I am fanatical abut measuring each piece frequently. When, I am done, I know it will fit. Of course, sometimes I still screw up – I am not happy with the fit of my Levenwick sweater for instance. On the whole, however, a sweater designed and hand knit for an individual will fit better than any off-the-rack piece – the same as a hand-tailored suit from a Saville Row tailor will beat any off-the-rack suit. The comments I have made about fit apply equally well to the knitted fabric. Hand knitting does not imply that the stitches will be sloppy and uneven, and machine knitting does not guarantee a good fabric. Finishing is an area that can distinguish a hand knit, but once again, not necessarily. I am frequently appalled by the quality of finishing in manufactured knitwear. Finishing is a skill – a good hand knitter will learn excellent finishing skills. 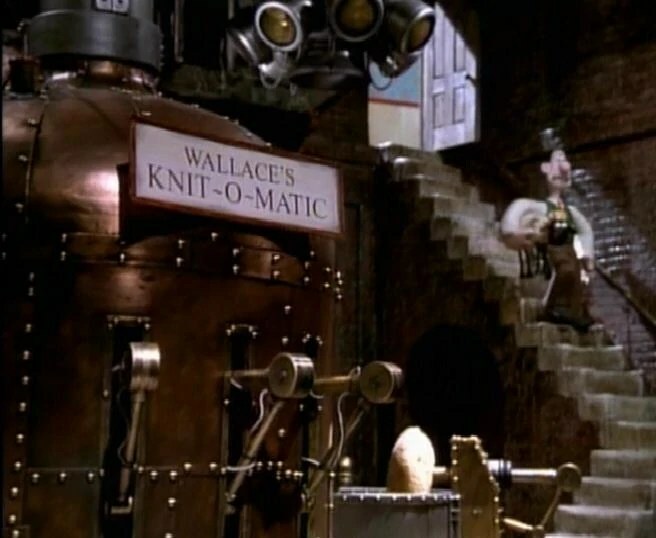 In fact, many couture knits are knit by machine but finished by hand. A couture knitwear designer knows that hand finishing, when done well, gives a much more professional look to a garment. That said, let me say that I have seen many totally horrendous hand knit sweaters; some are truly cringe-worthy. However, this is most certainly true of storebought goods as well. I have seen tons of poorly made and poorly fitting sweaters on sale in shops. In fact, many of them seem to be made to last for only a season before they fall apart. (I think many people now expect this of their purchased clothing; when was the last time you didn’t have to resew the buttons on a new coat?) My Jill Sander sweater, on the other hand, is perfect, fits like a glove and will last for decades. My point? Both hand knit and manufactured clothing can range from the hideous to the sublime. So why do we persist with these underlying assumptions that hand knit is bad and machine knit is good? As a final comment, let me say that completely apart from the quality of a garment and the skill which the knitter brings to it, a hand knit garment is made with affection, it is a gift from the heart. We all appreciate the difference between buying someone a box of cookies, and lovingly hand chopping chocolate, and beating the sugar and butter to make a batch of home made cookies. In this regard, a hand knit sweater is like a chocolate chip cookie, warm and gooey right out of the oven. Enjoy! Really enjoyed this post–in particular—because as a person who loves her sewing machine–a machine that has made many, many items, including men’s and women’s suits, coats and dresses, blouses, pants for my children and myself over the years, measuring and measuring and re-measuring is the only way to get perfectly fitted clothing–whether knitted or sewn. Great post by a fantastic knitter. Hi Mom, Funny you should say this…as I was writing this post, I was remembering many of the beautifully tailored pieces you have made for me over the years. As a case in point, almost thirty years ago when I got my first job in a Washington DC law firm, you made me a two-piece fully-lined suit in navy blue, with a pencil skirt and fitted peplum. It fit perfectly and was ultra fashionable. I never would have been able to buy something so perfect for me. I have very fond memories of your sewing machine, and of shopping with you for fabric and patterns. Kelly, I will admit- I don’t do swatches. But I have only knit a few clothing items- mostly afghans, washcloths, etc that the exact size doesn’t matter as much.